Havoline motor oils, marketed by Chevron Philippines Inc. (CPI), recently awarded Pauline Rose Temana with a brand-new Vespa scooter as the grand prize winner of its True Power from Within promo. The nationwide promo, launched in conjunction with Michael Bay’s Transformers: The Last Knight, ran from May 1 to July 31. Caltex customers purchasing Havoline, Delo or Techron Concentrate Plus promotional packs received a Transformers: The Last Knight T-shirt or microfiber towel. Other promo prizes included 5 Bose speakers and 10 Robinsons shopping vouchers worth P 2400 each. “There’s always been more to Caltex products than meets the eye. Our range of engine oils is designed to shield engine parts from harmful deposits, protecting the engine from within and delivering optimized driving performance and fuel economy with continued use. 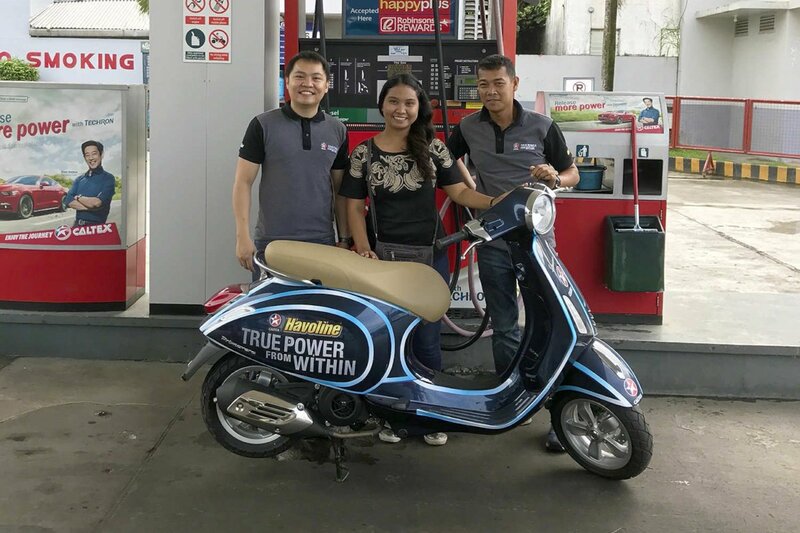 Our movie tie-up makes every journey with Caltex a more rewarding one,” said Lennard Kwek, Chevron’s Lubricant Marketing Manager for Asia Pacific.